Yep, we are back! Sorry for our absence from the podcasting broadcast waves and of course the Savage Critic site itself. After the jump--show notes! But before we get there, I wanted to congratulate House to Astonish for their 100th Episode! I'm listening to it now, and want to recommend it for people who like what Graeme and I do but would maybe like it if it was done much better? Congrats to Al & Paul! Now, then. Where was I? Oh, right. Actually, as long as I'm on the linking-to-not-Wait-What? tip, I should mention I had a great time talking movies with Sean Witzke over at the Factual Opinion's movie podcast, Travis Bickle on the Riviera. As I said on Twitter, I make a terrible Tucker Stone stand-in, but being able to talk Lincoln, The Seven-Ups, All That Jazz, and John Woo's The Killer (among others) was an opportunity I refused to pass up. Big thanks to Sean for that, and if there are those brave, masochistic few that haven't had enough of my braying laugh yet, please do check it out. 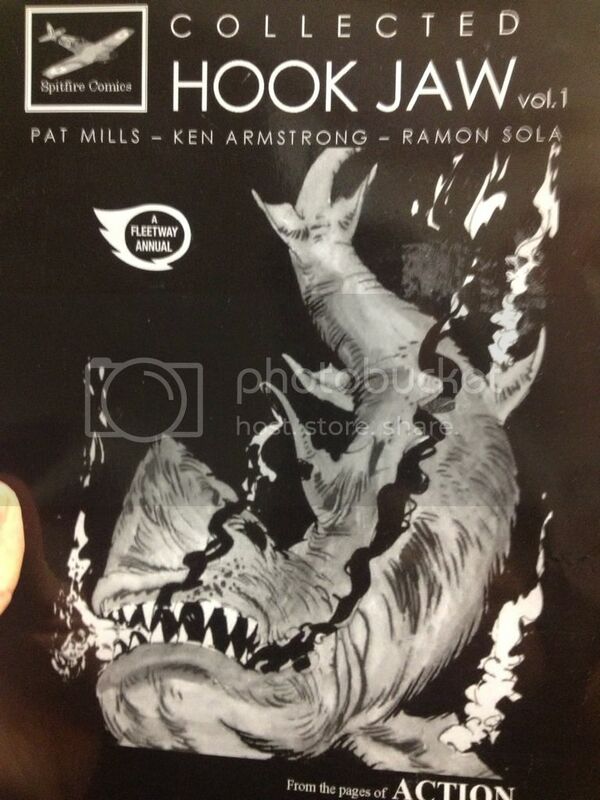 6:59-9:44: "But, instead, let me read three pages of Hook Jaw…" Who does that sentence turn out well for? Not someone who has other things to do, that's for sure. In other words, Hook Jaw is awesome, unless you're Jeff who is trying to procrastinate. 9:44-13:11: Moving on from Hook Jaw, Jeff also picked up issues #3 and #4 of Happy by Grant Morrison and Darick Robertson, and talks about that (although with a lot less evil oil rigger imitations). 13:11-20:04: As long as we're on the G-Mo Train (and let's be honest, when aren't we on the G-Mo Train? ), Jeff also read Action Comics #17. Since Graeme hasn't, the conversation is not especially weighty. But, hey, for those of you filling out your Wait, What? bingo cards, feel free to fill that in…even if it really should be the card's free space by now. 20:04-21:59: "Where on the Morrison spectrum does Batman Inc. fall for you?" Yeah, we are not out of the k-hole that is Grant Morrison yet. Not nearly. 21:59-43:07: And so we're out, via discussion of Batman #17, the "Death of the Family" finale by Snyder and Capullo. Graeme references the discussion that he had over at Kotaku with his smart friends, and it's only fair I include a link to that here. Graeme also talks about the follow-up issue of Batman & Robin which Jeff forgot to pick up at the store, dammit. 43:07-50:54: We discuss Justice League of America #1. Has it been a while since we've really dug into DC titles, or is it just me? 50:54-58:14: But speaking of not speaking of Marvel, Graeme read issue #6 of The Avengers by Hickman & Kubert thinking Jeff would've read but didn't and then he has to talk about it all by himself. Haw, haw! Sucker. 58:14-1:01:43: Jeff has read Thor #5 by Aaron & Ribic, and man is that a pretty book. This isn't much of a review as much of a collection of spoilers with a bunch of fanning compliments about the art, but, eh. That's how it happens sometimes. 1:04:39-1:07:13: Graeme really liked issue #23 of Daredevil by Mark Waid and Chris Samnee, which apparently is a great jumping-on point for the book. Jeff is pretty jealous. The term "a perfect superhero comic" is used as well as the phrase "amazing, amazing stuff." 1:07:13-1:13:55: Jeff asks about the Superman H'el on Earth storyline because, eh, he's honestly curious. What can he say? And Graeme gives all the deets. Unfortunately, at this point, Jeff's head moves one step closer to its MODOK stage and the crunching of the headphones tightening around his ears can be heard in the background. Embarrassing and awkward! 1:13:55-1:26:46: Also, does Graeme have a take on the new Green Lantern teams? Whatnauts wanted to know, so Jeff also asks about that bit of business. A bit of analysis about what DC is doing and where they're heading is probably inevitable. 1:26:46-1:50:54: And of course we are going to discuss "Oscar Scott Card." Probably also inevitable. There's also some discussion of Jeff and his ever-growing collection of bad-faith boycotts that may be kind of interesting to some. A surprising admission is made, let's just say. 1:50:54-1:54:34: More comic reviewy stuff! Uncanny X-Men #1 by Bendis and Bachalo has been read by Jeff so he blabs about it for a bit. 1:54:34-2:14:02: Last issue of Hellblazer! It's been read by Graeme so he blabs about it for a bit, as well. (Spoiler alerts, of course.) He's got a great prediction here for a possible announcement during con season--be on the look-out for it. We hope you enjoy and thanks for listening! Action Comics, Batman, Batman Incorporated, Brian Michael Bendis, Chris Bachalo, Chris Samnee, Daredevil, Darick Robertson, Death of the Family, Esad Ribic, Geoff Johns, Graeme, Grant Morrison, Green Lantern, Greg Capullo, Hellblazer, Hook Jaw, House to Astonish, Jason Aaron, Jeff, Justice League of America, Justice League: Vibe, Mark Waid, Nova, Oscar Scott Cord, Oslo Comics Expo, Pat Mills, Scott Lobdell, Scott Snyder, Superman, Thor, Travis Bickle on the Riviera, Uncanny X-Men, Vertigo, Wait What?